The Nepali Army "High Altitude and Mountain Warfare School" (HAMWS), is known for its glorious mountaineering history and is also considered as the most prestigious mountaineering school in Nepal. The history of the HAMWS dates back to year 1974, when the Nepali Army (NA) was mobilized to disarm a group of armed Tibetan guerillas (Khampas) who were conducting military operations against Chinese authorities in Tibet from the bases in the Himalayan regions of Nepal. Kaisang Camp (lies in the Northern part of Nepal in Mustang district), during the early 1970s was the Khampa guerilla's headquarter. Although Nepal had been allowing the inflow of civilian refugees into various parts of the country, she could not permit her territory to be used as guerillas base. To end this, NA was called to "Disarm the armed Khampa guerillas" operating in Nepal. The operations against Khampas tested NA's operational readiness in mountain operations and necessitated the establishment of a training institution for high altitude operations. Thus the NA's experience in this operation lay the founding stone for the establishment of the HAMWS in 1975. The surrounding scenery of Kaisang is breathtaking. The spectacular sight of Mt. Nilgiri and Mt. Tilicho during sunrise is one of the splendors of the nature. Equally as the sunset, the Mt.Dhaulagiri, Mt.Tukuche, Mt. Tilicho and Mt.Nilgiri are silhouetted against a backdrop of coral, purple and indigo colors. The surging flow of the Lampodyang River and Nilgiri Moraine through the Kaisang valley from the blue ice of Tilicho and Nilgiri glaciers also presents a worthy spectacle. The mission of this school is to produce proficient mountain warriors and military mountaineers who are capable of conducting military operations skillfully with vigor in high altitude area. To progressively expand and improve the ongoing training program and deliver relevant and meaningful mountain warfare training to Nepali and foreign students, thereby enriching their capability of conducting effective military operations in high altitude mountainous terrain. (a) Conduct basic and advance mountain warfare course for Nepali army. 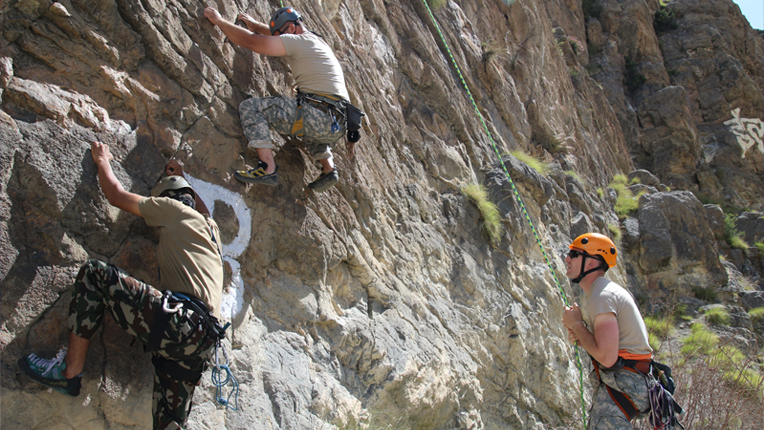 (b) Conduct regular high altitude and mountain warfare courses for the foreign students. (c) Be prepared for mountain rescue operations. (d) Develop highly qualified instructors. (e) Act as a reserve force of brigade. (f) Participate in various expeditions. (g) Assist civil authorities during natural calamities. (a) Conducted before regular mountain warfare course. (2) Develop knowledge and skills. Acquaint trainees with climatic conditions and natural difficulties. To impart knowledge about mountainous terrain, rock craft, ice craft and mountainous hazards. Acquaint trainees with OPS of war and CI environment in High altitude. (2) Produce highly qualified instructors. (3) Produce active members of expedition team. (1) Acquaint with the condition in Himalayan high attitude. (2) Establish cross cultural communication. (3) Interact among the friendly armies of different nations. (4) Exchange of mountaineering skills, techniques and experience. (5) Strengthen friendship and harmony. This School has been supporting to conduct the Balance nail/ Teak nail training of Nepali Army and US Army. (c)Aim: To develop mountaineering skill, technique and experience.